US rail traffic continued its slump in March, falling -5.2% to 2,022,934 carloads and intermodal units compared with volumes in March 2018, according to Association of American Railroads (AAR) data released April 5. 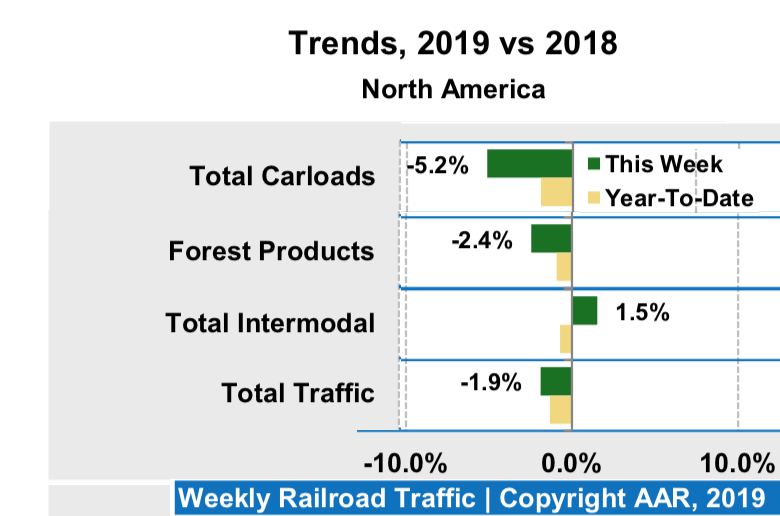 In it’s latest release, issued Wednesday, AAR reported US rail traffic for the week ending April 6, 2019, at 510,192 carloads and intermodal units, which is down -2.8% compared with the same week last year. Total carloads for the week ending April 6 were 251,417 carloads, down -3.9% compared with the same week in 2018, while US weekly intermodal volume was 258,775 containers and trailers, down -1.6% compared to 2018. In Canada, meanwhile, Statistics Canada announced March 29 that the country’s railways carried a total of 32.2 million tonnes of freight in January, up +7.8% from the same month a year earlier. The Federal agency reports that total rail freight originating in Canada was up +11% from the same month in 2018, to 29.4 million tonnes in January. Canadian freight traffic received from the United States fell -16.8% to 2.8 million tonnes as a result of a -17.2% decrease in non-intermodal freight. Across North America as a whole, transportation of forest products for January to March 2019 was down -1%, to 219,640 cars. For Canada rail traffic of Forest Products in USA was down -2%, to 89,006 cars. And for the US it was flat at 130,368 rail cars.